Check out the Bridal – Sectioned Responsive Shopify Theme | Multipurpose for Wedding & Couple theme if you’re looking to launching a Shopify base wedding store that requires zero-coding and comes along with an infinite of fresh and clean, responsive layouts. 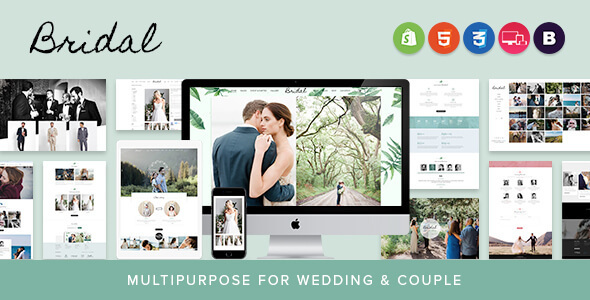 Bundled with countless layout variations and amazing customization capabilities, offering an extreme selection to have a desirable wedding-related website done within no time. Choosing the right Bridal theme when it comes to reliability, ease of use, and customizing possibilities is crucial in ensuring that the site transforms smoothly. Thanks to the handy Drag & Drop Page Builder, enable you to effortlessly craft a real-time and instant professional looking layout with pixel perfect accuracy. Crafted with the mobile first design philosophy, it provides an superbly responsive web experience no matter how it’s running on a desktop, smartphone, or tablet. It comes with plenty of features you could expect from a wedding theme, such as captivating slideshows with extensive eye-catching special effects, countdown timer, instagram photo, Dropdown Mega Menu, and loads of other worthy functions. This theme also heavily packed with tons of beautiful modern styles with image-focused that is designed to showcase your wedding photos. In addition, the theme incorporates unlimited color variations, multilingual and multicurrency supports, elegant, crisp typography, mailchimp, contact form, google map also fully integrated. Along with endlessly versatile, incredible intuitive interface, it’s super fast in loading, super SEO friendly since it’s optimized by either Shopify base itself and tvlgiao’s developers. The theme’s also equipped a detailed, extensive documentation so that building your store will be worry-free. As you need any further information regarding to the theme as well as having a prior purchase question, please don’t hesitate to reach out our support team out there. Check out Bridal – a Sectioned Responsive Shopify Theme for wedding celebrating, wedding gifts store if you’re looking to launching a Shopify base wedding store that requires zero-coding and comes along with an infinite of fresh and clean, responsive layouts. Bundled with countless layout variations and amazing customization capabilities, offering an extreme selection to have a desirable wedding-related website done within no time. Bridal Sectioned Shopify theme allows to add new sections on your pages. Reordering existing sections. Editing content within sections a breeze. NO, only the a few of new Shopify themes support sections. Bridal is a new Drag & Drop Sectioned Shopify Theme which was developed to fully support and take advanced of Shopify sections’ powerfulness.